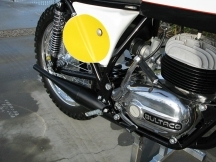 In 1968, Bultaco was a serious threat in any of the smaller displacement classes. Sr. Bulto decided he would like to build a bike to complete in the Open 500 cc class. His answer was the El Bandido 360. According to articles written in the day, it was light and handled well, but was the most powerful bike ever tested. This monster engine made riding with style and finesse, very difficult. It was a handful to say the least. Most riders did not like trying to man handle The Bandit especially in Motocross, so they never became as popular as the Maicos, Huskys and CZs of the period. A few years later, the upgraded 360 Pursang replaced the El Bandido and garnered enormous success.